Best game I've played on android (and better than any ios game I've played ). Great starship-captain simulator; wish there were more games like this! Easily worth the price. Well worth it! Loads of fun and constantly being updated. No bugs or issues on my HTC Inspire. Love it! Installed the free version and have been unable to stop playing it so had to reward developers with buying full version. Well worth the money! Great time killer	If your stuck somewhere bored outta your mind, play THIS GAME. Love it	Played for hours. It does stall once in awhile but frees up quickly. Player for a week on free before buying. This is the first app I have paid for. Best game ever!!!! If updates keep coming like this it will be the.best game on the market!!!! Dunbar	All the updates makes this game great! The gameplay is still as addictive as the first time you play it! Thanks guyz! 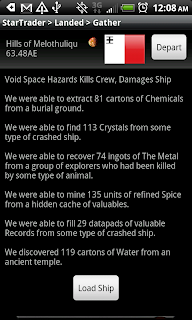 Need an update for help/guide: for example, so many ships type dont exist. Game is very good. It's a good thing I'm not charged by the hour because I spend WAY too much time on this. Excellent game!